Manchester United can give up hope of signing AS Roma's Dutch midfielder Kevin Strootman in the next transfer window, the Italian club's owner told the BBC on Wednesday. United, managed by Strootman's former national coach Louis van Gaal, have been strongly linked with the player who is still recuperating after suffering a serious knee injury in March. "It is just not happening," James Pallotta said at the Leaders in Football Conference. 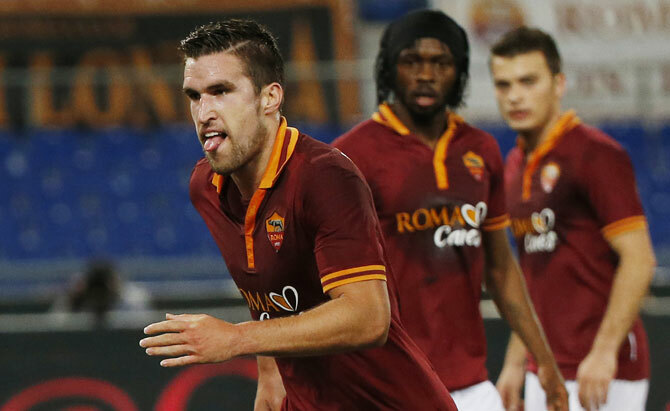 The 24-year-old Strootman, who has played 25 times for his country, would add much-needed steel to the United midfield and was a favourite of Van Gaal's with the Dutch national side. "Obviously, as business people when people call us and say 'we want your player' you are going to listen to them," Pallotta said. "You have to do that, that is the business side. That doesn't mean you are going to make a decision that 75 million pounds ($121.1 million), bang you hit the bid. That is not the way it is going to work, it is not the way it does work with us," he added.